When people visit the Midwest LSA Expo, a popular LSA-oriented show in early September, those visitors will likely run into an expert airplane broker, Eric Evans. As you'll hear in this video, Eric knows his way around a wide variety of airplanes, including many used aircraft. Eric tells us his view of the LSA market as we speak about a beautiful 2009 Jabiru that most viewers would think is brand new. He also tells about his concept to offer LSA training where he goes to the customer's airport, a terrific idea. When people visit the Midwest LSA Expo, a popular LSA-oriented show in early September, those visitors will likely run into an expert airplane broker, Eric Evans. As you’ll hear in this video, Eric knows his way around a wide variety of airplanes, including many used aircraft. Eric tells us his view of the LSA market as we speak about a beautiful 2009 Jabiru that most viewers would think is brand new. He also tells about his concept to offer LSA training where he goes to the customer’s airport, a terrific idea. At the Midwest LSA Expo in 2014, we spoke with Jabiru USA owner Pete Krotje about some significant changes made to one of the popular powerplants in the light aircraft space. Used on Jabiru airplanes, the engines are also offered for many other airframes where Jabiru USA provides what is called a "firewall forward kit" offering a home builder everything needed to do an installation. Here the new features from this company, now celebrating 15 years serving the American market. At the Midwest LSA Expo in 2014, we spoke with Jabiru USA owner Pete Krotje about some significant changes made to one of the popular powerplants in the light aircraft space. Used on Jabiru airplanes, the engines are also offered for many other airframes where Jabiru USA provides what is called a “firewall forward kit” offering a home builder everything needed to do an installation. Here the new features from this company, now celebrating 15 years serving the American market. 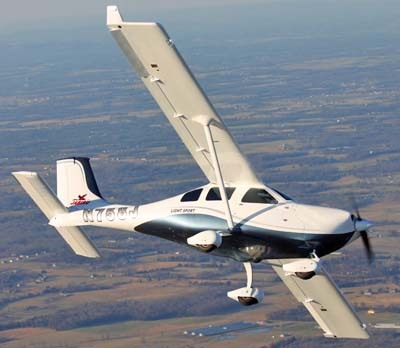 Jabiru Aircraft has long done well with their line of affordable, speedy, and U.S.-assembled aircraft. Yet following the difficult recession years, owner Peter Krotje thought he could do even better, but lowering the price. How is that possible ... especially a $25,000 cut of retail price? See the video for more detail but basically the Australian manufacturer sells a kit to a South African company that is highly effective at building these kits. Afterward, Jabiru USA imports and finishes their work. Despite a lot of freight, you pay less. Buyers will enjoy big savings. 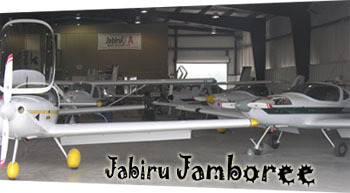 Jabiru Aircraft has long done well with their line of affordable, speedy, and U.S.-assembled aircraft. Yet following the difficult recession years, owner Peter Krotje thought he could do even better, but lowering the price. How is that possible … especially a $25,000 cut of retail price? See the video for more detail but basically the Australian manufacturer sells a kit to a South African company that is highly effective at building these kits. Afterward, Jabiru USA imports and finishes their work. Despite a lot of freight, you pay less. Buyers will enjoy big savings. In Shelbyville, Tennessee, two LSA companies are located side-by-side. 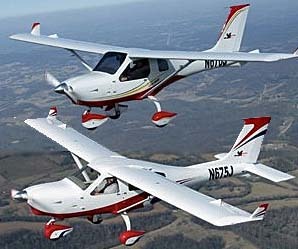 The two are Jabiru USA and Arion. The former builds a line of high wing composite LSA lead by the J-230. The latter created and builds the sleek Lightning LS-1. In our review shot in 2011, we cover both companies and the Jabiru engine that powers both plus some other brands. Watch (rather than listen) for the correct web address for all companies, or click the link above the thumbnail photo on the LSA Videos page. Jabiru is the one company I know of that produces both the airframe and the engine under one brand. Jabiru US purchases a basic kit from Australia (along with the engine) and assembles the package in Shelbyville Tennessee. The company has enjoyed consider success at this venture. We and many other journalists have arrived in EAAworld and are gearing up for another big event. Here are two aircraft announcements of interest and one avionics offering. More will follow. Jabiru USA has news prices and new gear for their speedy line of kits and LSA. Jabiru USA Sport Aircraft is celebrating ten years in the Light-Sport Aircraft market by offering a new large-screen Garmin G3X Touch avionics package as standard equipment for its J230-D high-performance composite LSA while lowering the price of the fully-loaded aircraft to $119,900. 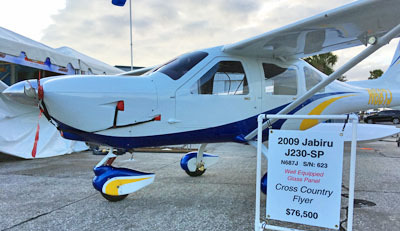 The Australian-designed Jabiru J250/230 series has been flying in the U.S. since 2005 and is known for its speed, easy handling and large baggage capacity. "By simplifying our overhead, we are now able to offer the new fully-equipped J230-D with the Garmin system for $119,900, a price cut of nearly $20,000," said Jabiru USA general manager Pete Krotje. The lower price of the aircraft reflects the original goals of both Jabiru and the creators of the Light Sport rule--to make aviation accessible to as many people as possible. 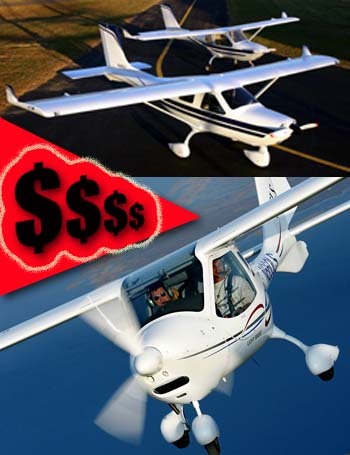 "The pricing of today's Light Sport aircraft is sort of getting out of control," noted Pete. "We wanted ... to create an airplane that makes flying accessible to people who thought that owning a safe, capable and comfortable new airplane was beyond their financial reach." Garmin's G3X Touch offers unmatched situational awareness and an intuitive pilot interface. The system features a 10.6-inch touch screen primary flight display, two-axis autopilot with automatic stability control, a 2020-compliant ADS-B package with in-flight weather and traffic, as well as the capability to display a full complement of geo-referenced aeronautical charts. Each of the six cylinders of the 120-horsepower Jabiru 3300 engine are monitored by the Garmin at all times, providing a complete picture of the performance of the engine to the pilot. Garmin's radio and transponder are remotely mounted giving a clean panel design. Both can easily controlled through the touch screen interface. The J230-D instrument panel is designed to easily accommodate a secondary portable device, such as a tablet (photo) or handheld GPS. Other standard features of the J230-D include a full-size baggage door, LED exterior and interior lighting, leather seats, upholstered headliner and baggage area, ground-adjustable carbon fiber propeller, and 120-knot cruise speed at 5.5 gallons per hour. Jabiru invites AirVenture attendees to come see a Garmin-equipped J230-D in Booth 313 located just north of the Theater in the Woods. MGL Avionics, one of the very first producers to promote touch screen digital instruments in the LSA and light kit community, reported, "The long-awaited Explorer-Lite is now available and shipping!" MGL Avionics explained that their iEFIS Lite series "is revolutionizing the small airplane instrument panel. For single-screen EFIS installations in Experimentals and LSAs, iEFIS Lite offers everything needed." The second release in their "Lite" series, Explorer-Lite 8.5 is a larger instrument that features a bright, non-reflective eight and a half-inch touchscreen of around 1000+ nits. Since you probably don't know what a "nit" is, TechTarget.com reported, "A typical active-matrix LCD panel has an output between 200 and 300 nit." By that reference, MGL's Explorer-Lite 8.5 should seem very bright even in a sunlight situation. "Explorer-Lite 8.5 looks, feels and operates just like a full iEFIS, however it does not require the additional iBox since pitot/static, GPS receiver, and attitude sensor are all built into the back of the screen." So, unless you need to connect more than two RS-232 devices to your EFIS (such as radio, transponder, or ADS-B) or unless you need more than one screen or have other complex requirements, MGL's Explorer-Lite 8.5 appears to do it all. It has the same powerful G3 processor and runs the same firmware as a full iEFIS system and has all of the same software features losing only complexity during installation. Homebuilders would seem to love that prospect. MGL said Explorer-Lite 8.5 starts at $2,850. A few options could raise the price but this is quite affordable. Kitfox Aircraft is one of the most celebrated of all American sport aircraft with many thousands flying successfully, not only in the USA but all over the globe. In 2015, this western U.S. company steps up their game even further making their handsome airplane perform even better with some new choices. The company has developed a new option for their proven S7 Super Sport design, one of the most polished models this company has ever offered. Completed recently and then flown to AirVenture Oshkosh, Kitfox is promoting their new STi (for STOL Inspired) retrofittable wing option. Proprietor John McBean said, "[The new STi wing] cuts takeoff and landing ground roll by more than 150 feet, and only reduces the cruise speed by less than 25 mph." Any STOL design comes with a speed reduction as you can't have it both ways. "I think it is a fair price to pay for your STOL specific mission," expressed John. All prior S7 Super Sport models had takeoff and landing ground rolls of only around 300 feet, which usually suffice for island beaches, river sand bars, or the mountain backcountry. However, Kitfox Aircraft continued to get requests for shorter takeoff and landing distances so owners can literally fly from their back yard or driveway. "The STi wing delivers," beamed John! As president of Kitfox Aircraft, John invites you to visit their display in the North Aircraft display (booth 634 and 635) ... where all the kit builders tend to congregate. At their space you can take a look at what he flew 1,200 miles from the factory at Homedale, Idaho. He further entices you with this comment, "We have a few other surprises, too, like our Shock Monster 2.0 landing gear." 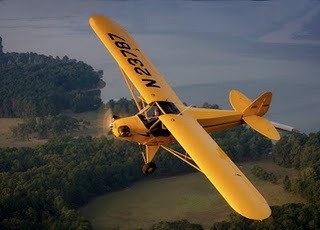 Stay tuned ... more Oshkosh light aircraft news to follow! We and many other journalists have arrived in EAAworld and are gearing up for another big event. Here are two aircraft announcements of interest and one avionics offering. More will follow. Jabiru USA has news prices and new gear for their speedy line of kits and LSA. 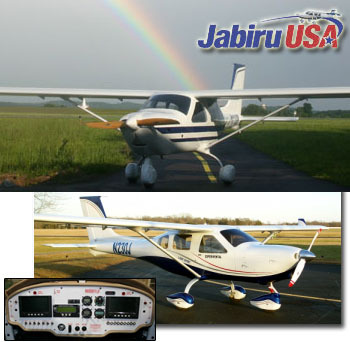 Jabiru USA Sport Aircraft is celebrating ten years in the Light-Sport Aircraft market by offering a new large-screen Garmin G3X Touch avionics package as standard equipment for its J230-D high-performance composite LSA while lowering the price of the fully-loaded aircraft to $119,900. 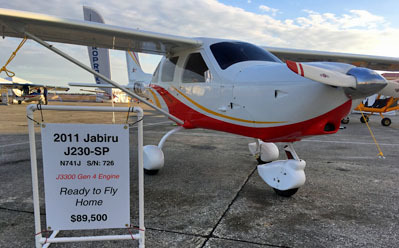 The Australian-designed Jabiru J250/230 series has been flying in the U.S. since 2005 and is known for its speed, easy handling and large baggage capacity. “By simplifying our overhead, we are now able to offer the new fully-equipped J230-D with the Garmin system for $119,900, a price cut of nearly $20,000,” said Jabiru USA general manager Pete Krotje. This composite image shows the J230 and J170 Jabiru LSA in flight. Jabiru's six cylinder 120-horsepower 3300 engine. For their 15th anniversary celebration, Jabiru is inviting all owners and anyone interested in light aviation to their Shelbyville, Tennessee headquarters. South Africa receives a kit and assembles it, then shipping to the USA, where Jabiru USA completes the airplane. In the Light-Sport Aircraft industry, many companies are celebrating fairly young birthdays, at least compared to 80-year-old legacy companies in the GA space. One of those is Number 8 ranked Jabiru, with more than 100 airplanes delivered in the USA. That is whole aircraft with that name, but remember, this is one only a very few companies that produces both airframes and engines under their brand. The U.S. outlet for the Australian brand (more on this below) announced, “Jabiru USA Sport Aircraft, LLC will celebrate its 15th anniversary the weekend of October 3rd through the 5th, 2014.” They sent out an invitation for all Jabiru owners, both aircraft and engine, as well as anyone interested in the lighter end of aviation to join them for a celebration. The company said it “will feature a Friday evening cookout with some fun & games, a Saturday breakfast fly-out to Winchester, TN, engine maintenance sessions Saturday morning and Saturday afternoon, a presentation on avionics updates including ADS-B, and a separate session on available engine updates. Pete Krotje (L) works with Mark Stauffer to remove the cowl on a Rans S-19 powered by the Jabiru 3300 engine. The 85-hp Jabiru 2200 four cylinder engine. At the Midwest LSA Expo 2010,a crowd gathers to examine the J-230 Jabiru SLSA. What do sugar cane harvesting equipment and light aircraft and engines have to do with one another? The former was the original work of Jabiru founders Rod Stiff and Phil Ainsworth. The latter is what occurred after a trip to Europe back in 1988. While they traveled, the other partners voted them out of the company and on their return they got a check for their equity. *** So Rod and Phil did what entrepreneurs do. They took their dough and started a new company. This is the story Jabiru USA boss Pete Krotje told to begin his talk about the engines and airplanes the duo created. *** The first Jabiru flew in 1991 under Australia's then-new "ultralight" rule that allowed a new class of aircraft with no medical (long before FAA found such a solution useful). That first airplane — called a Light Sport Aircraft, again well before FAA used a similar term — used a KFM engine but that powerplant company soon said they were leaving the business. Thus was born one of only two companies I know that makes both airframe and engine. (The other such company is Sonex, which offers the AeroVee kit engine). 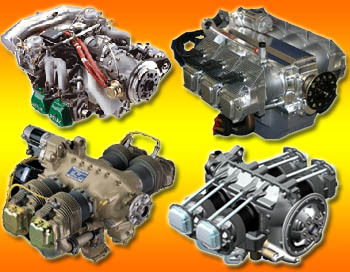 *** The Jabiru engine uses auto industry parts, such as pistons and valves from Toyota. Among other tactics, this held down costs and started Jabiru down a path of delivering 6,000 engines to 45 countries. In addition, some 2,000 Jabiru airplanes are flying worldwide, 600 of them in Australia. Today, 80% of all flight training in Australia is done behind Jabiru engines. 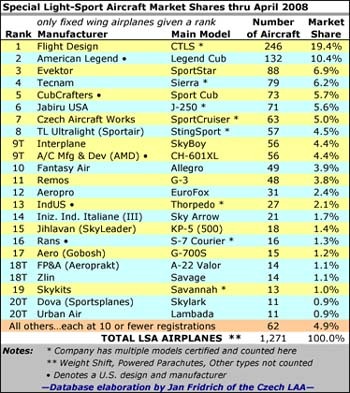 In South Africa the J-planes are the market leader. More recently, China took delivery of 20 of these airplanes with 20 more on order and an additional 20 forecast. *** The heart of the engine is the crankshaft and unlike other brands, the Jabiru crank starts as a seven-inch round shaft of steel which is fed into a CNC machine. Heads are milled from aluminum. Pete offered additional details of these powerplants but you'll need to attend one of his forums to get the whole story. *** In an interesting twist, Jabiru does not set the TBO for their engines. Instead CASA (the Australian FAA) sets the TBO, which is now 2,000 hours, the same as Rotax and Continental. *** Demonstrating his own entrepreneurial strength, Krotje's Tennessee-based JabiruUSA has become the #7 ranked SLSA producer. What do sugar cane harvesting equipment and light aircraft and engines have to do with one another? The former was the original work of Jabiru founders Rod Stiff and Phil Ainsworth. The latter is what occurred after a trip to Europe back in 1988. While they traveled, the other partners voted them out of the company and on their return they got a check for their equity. *** So Rod and Phil did what entrepreneurs do. They took their dough and started a new company. This is the story Jabiru USA boss Pete Krotje told to begin his talk about the engines and airplanes the duo created. *** The first Jabiru flew in 1991 under Australia’s then-new “ultralight” rule that allowed a new class of aircraft with no medical (long before FAA found such a solution useful). That first airplane — called a Light Sport Aircraft, again well before FAA used a similar term — used a KFM engine but that powerplant company soon said they were leaving the business. LSA Mall: Meeting Place -- Top leaders gathered in the LSA Mall, located a short distance from the new Oshkosh "World's Busiest Control Tower." [Bottom right] A present-day Big Three of LSA discussed industry development while waiting for the FAA Administrator's visit (R to L) Flight Design's Matthias Betsch, Tecnam's Paolo Pascale, LAMA's Larry Burke, and Remos' Corvin Huber. [Bottom left] Flight Design USA president Tom Peghiny speaks with AOPA journalist Alton Marsh. 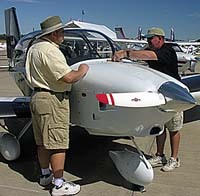 [Upper inset] EAA Radio host John Montgomery interviewed American Legend's Kurt Sehnert (standing) and Jabiru's Pete Krotje. In the background an Airbus A-380 performs maneuvers. Viewed from the LSA Mall, AirVenture 2009 was much more than the summer's big celebration of flight. Several important events tell a story of growing acceptance of LSA. Here's a short list: LAMA hosted a meeting of G10 (the 10 largest LSA producers) and another of G5, while paying visits to every LAMA member in attendance. *** At the G10 meeting and again at LAMA's press conference, Avemco president Jim Lauerman detailed his company's support (in writing) for LAMA's audit activities. His expressions were corroborated by Falcon Insurance VP Bob Mackey. *** Earl Lawrence, VP of government relations for EAA, brought brand new FAA administrator Randy Babbitt to the LSA Mall, where he met with presidents of LSA companies: Flight Design, Tecnam, Remos, and IndUS. *** At AOPA's invitation, LAMA arranged a meeting for several LSA industry leaders with new AOPA president Craig Fuller. 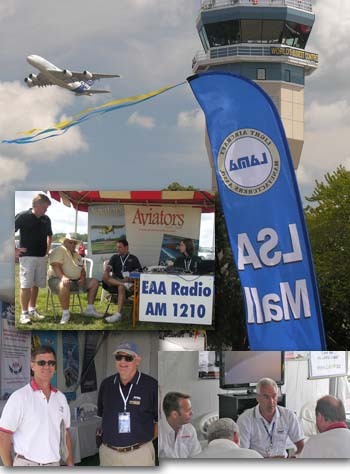 *** EAA Radio broadcast from the LSA Mall interviewing top producers from American Legend, Jabiru, among other industry leaders. *** Of course, for tens of thousands of visitors, the LSA Mall was mainly the place to find shiny new Special Light-Sport Aircraft including all the top selling models. And with the LSA Mall as an "anchor tenant" of the new AirVenture display area, other suppliers also took space in what is shaping up as the (unofficial-for-now) LSA Area. Thanks to confirmation from EAA leadership, who now view the LSA Mall as a "destination," visitors to EAA's 2010 event should again find the latest and greatest Light-Sport Aircraft in convenient proximity. Viewed from the LSA Mall, AirVenture 2009 was much more than the summer’s big celebration of flight. Several important events tell a story of growing acceptance of LSA. Here’s a short list: LAMA hosted a meeting of G10 (the 10 largest LSA producers) and another of G5, while paying visits to every LAMA member in attendance. *** At the G10 meeting and again at LAMA’s press conference, Avemco president Jim Lauerman detailed his company’s support (in writing) for LAMA’s audit activities. His expressions were corroborated by Falcon Insurance VP Bob Mackey. *** Earl Lawrence, VP of government relations for EAA, brought brand new FAA administrator Randy Babbitt to the LSA Mall, where he met with presidents of LSA companies: Flight Design, Tecnam, Remos, and IndUS. *** At AOPA’s invitation, LAMA arranged a meeting for several LSA industry leaders with new AOPA president Craig Fuller. Here come the American engines! 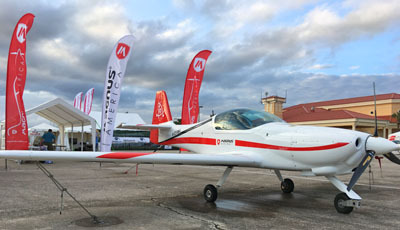 Rotax 912s from Austria presently dominate the LSA market with an estimated 70% of installations. Australia's Jabiru with two engines (85-hp 2200 and 120-hp 3300) has another estimated 15%, leaving the U.S.-built Continental O-200 with about 15%. *** The Lycoming O-235 has been used (in Falcon LS and an RV-9 ELSA) but never LSA optimized. At Oshkosh '08, the Pennsylvania company announced development of their IO-233 aimed specifically at LSA. At its heart, the new engine is an O-235, but it's been equipped with electronic ignition, fuel injection in lieu of carburetors, and smaller jugs. "We shaved 40 pounds with thinner induction pipes and a less bulky flywheel, among other changes," said Mike Kraft, Lycoming's VP of engineering." The IO-233 can produce 100 horsepower at 2400 rpm and 116 horsepower at 2700 rpm. *** Despite the weight reductions, the new Lycoming will be significantly heavier than a Rotax 912, perhaps a third more (installed weight can vary due to a variety of factors -- see photo legend). However, the Lycoming has a 2400-hour TBO, much longer than Rotax's 1500 hours. Kraft said the IO-233 will run on high-octane mogas or 100LL. The company expects to meet ASTM standards but is still looking at Part 33 approval. No price was announced. Here come the American engines! Rotax 912s from Austria presently dominate the LSA market with an estimated 70% of installations. Australia’s Jabiru with two engines (85-hp 2200 and 120-hp 3300) has another estimated 15%, leaving the U.S.-built Continental O-200 with about 15%. *** The Lycoming O-235 has been used (in Falcon LS and an RV-9 ELSA) but never LSA optimized. At Oshkosh ’08, the Pennsylvania company announced development of their IO-233 aimed specifically at LSA. At its heart, the new engine is an O-235, but it’s been equipped with electronic ignition, fuel injection in lieu of carburetors, and smaller jugs. “We shaved 40 pounds with thinner induction pipes and a less bulky flywheel, among other changes,” said Mike Kraft, Lycoming’s VP of engineering.” The IO-233 can produce 100 horsepower at 2400 rpm and 116 horsepower at 2700 rpm. In the first four months of the year, we've seen a few climbers: Czech Aircraft Works and Remos improved their rank the most: Highest 2008 sales were (in order): Flight Design, CZAW, Remos, Jabiru, Tecnam, and Legend. I can identify four factors in the economy presently affecting airplane sales: Potential customers (often with plenty of assets or creditworthiness) see the value of their stock portfolio going up and down like a roller coaster; worry over their once-soaring real estate, now down markedly in some areas; witness the continuing rise of the euro-dollar exchange rate, bringing much higher prices for many LSA; and, fret over a climate of political uncertainty during another election cycle. *** Perhaps due to these factors GA single engine piston sales are off 28% compared to the same period last year, according to GAMA. LSA sales are off 30% compared to trends six months to a year ago. *** Jet and turbine aircraft sales are up, but 2008 deliveries of those aircraft stem from orders taken 2-3 years ago. Contrarily, personal and sport aircraft sales react quickly to the slightest perception of economic shakiness. *** Despite that we have some bright spots. Large ad expenditures paid off with a good advance for Remos. The Flight Design machine drives on as it always has and Czech Aircraft Works is experiencing healthy registrations. Jabiru continues to grow steadily and Urban Air's Lambada has made the top 20 for the first time. Hopefully, the last eight months of the year will offset the slow start in '08. I can identify four factors in the economy presently affecting airplane sales: Potential customers (often with plenty of assets or creditworthiness) see the value of their stock portfolio going up and down like a roller coaster; worry over their once-soaring real estate, now down markedly in some areas; witness the continuing rise of the euro-dollar exchange rate, bringing much higher prices for many LSA; and, fret over a climate of political uncertainty during another election cycle. *** Perhaps due to these factors GA single engine piston sales are off 28% compared to the same period last year, according to GAMA. LSA sales are off 30% compared to trends six months to a year ago. *** Jet and turbine aircraft sales are up, but 2008 deliveries of those aircraft stem from orders taken 2-3 years ago. Contrarily, personal and sport aircraft sales react quickly to the slightest perception of economic shakiness. *** Despite that we have some bright spots. 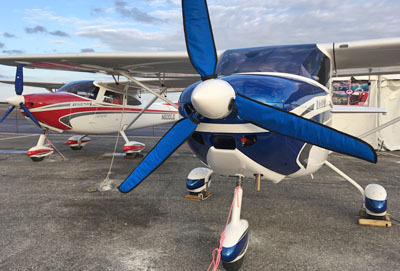 Jabiru USA's new J230-SP has the same cavernous three-door cabin as the J250 (top) but has a higher aspect wing fitted with winglets that cruises efficiently at altitude. Panels can be full glass. More info? SEBRING 2008 UPDATE -- Like rapid fire, approvals and preparations for the Sebring Expo are coming quickly. In less than a month before Sebring we've seen approval of the SeaMax amphib; Rans' all metal S-19; the super-wide S-Wing; all-new Flight Design CTLS; composite Dynamic WT9; long-gliding Lamabada, and many upgrades to the Thorpedo 120LP and 85LP. Now, welcome the fourth Jabiru: J230-SP. *** Good for flight schools, Jabiru USA president Pete Krotje added, "It's ideal for those longer cross country trips." J230-SP has achieved European JAR/VLA certification and Pete elaborated that J230 is one of the most tested LSA in the world because it passed all of the FAR Part 23 testing for strength, stability, and spin recovery. It has been drop tested from five feet at its design gross weight of 1,540 pounds with no serious damage. When operated at a gross weight of 1,320 pounds, design strength is reported to exceed ASTM standards by a good margin. *** Looking similar to the J250 (photo) J230-SP differs only in a wing design that employs a 105 square foot wing with winglets. "These winglets seem to give an effective increase in wing area that really helps low speed performance," said Krotje. SEBRING 2008 UPDATE — Like rapid fire, approvals and preparations for the Sebring Expo are coming quickly. In less than a month before Sebring we’ve seen approval of the SeaMax amphib; Rans’ all metal S-19; the super-wide S-Wing; all-new Flight Design CTLS; composite Dynamic WT9; long-gliding Lamabada, and many upgrades to the Thorpedo 120LP and 85LP. Now, welcome the fourth Jabiru: J230-SP. *** Good for flight schools, Jabiru USA president Pete Krotje added, “It’s ideal for those longer cross country trips.” J230-SP has achieved European JAR/VLA certification and Pete elaborated that J230 is one of the most tested LSA in the world because it passed all of the FAR Part 23 testing for strength, stability, and spin recovery. It has been drop tested from five feet at its design gross weight of 1,540 pounds with no serious damage. When operated at a gross weight of 1,320 pounds, design strength is reported to exceed ASTM standards by a good margin.